Remember when your birthday was your favorite day of the year? You looked forward to it all year around. You wanted to be older. You wanted to be bigger. You just wanted. Today is SJ’s birthday. 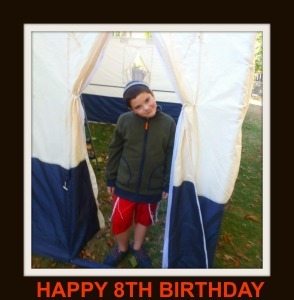 My youngest son is now 8-years old. He’s thrilled. “I’m not in a rush,” I said. In fact, I’m going to miss seven. At seven, SJ was in first grade. At seven, SJ became a Kindleaholic. At seven, SJ told me about the first girl he liked. I can’t go into details because I promised him I wouldn’t. A couple of days ago SJ and I were having a conversation. But I know. He’s normal. He’s like every other kid. And in this case, that’s good. Me, I’m not in a rush. Sometimes, when we are together at the kitchen table, I look at him when he is not looking back. I stare at his face and wonder and know. I see him getting older. I see him graduating elementary school, dancing at his Bar Mitzvah, borrowing the car keys, heading off to college, and walking down the aisle. This vision brings me warmth. My boy is going to have a good life. He will be happy. He’ll have friends. He’ll have a family. He’ll find success in his life. This vision brings me sadness. I miss one, two, three, four, five, six, and now seven. As our youngest when he completes something, be it potty training, kindergarten, or his multiplication tables, our family finishes it. We have passed that stage. The other day we traveled to the Philadelphia suburbs to spend time with my mother and other family members including an elderly aunt who is not doing well. While we were driving, we saw a train. Correction. I saw a train. I pointed it out to Ms. MMK. She shook her head in that, “That’s nice dear sort of way.” I was ready to alert the boys. But I stopped myself. They wouldn’t care. Yet at one point, seeing a train was a spectacle. They would stare at the train as it went by and then crane their heads to see it for as long as possible. As the train went one way and my family went the other, I got to wondering. What do you READERS still hold on to though your children have outgrown that stage? Do you still look for sales on baby food though your kids don’t eat it? Do you break into the Little Einsteins every time you have to countdown though your kids no longer admit they ever even watched the show? Do you still check out picture books – Goodnight Moon – though your kids are reading on their own? I don’t want SJ to stay as he is. I love seeing him grow and accomplish. But sometimes and in some ways, I miss my little boys. P.S. Today would have been my father’s 83rd birthday. He died the day after his 65th birthday. This entry was posted in Family and tagged birthday, Children, family, Goodnight Moon, Holden Caufield, Little Einsteins, seven by lardavbern. Bookmark the permalink. Sometimes I miss watching him play with it. He would get lost for hours and never need anyone else. Loved to play with others, but was content if we was alone with Thomas. SJ was the same when it came to Thomas and reacts similarly now. He wants to sell the trains. He’s a fine little capitalist! I’m still a bit of a child myself – 15 in September – but sometimes I do think my parents miss the younger years. Personally, I never really enjoyed being a kid, but it seems I’m in the minority there. Many of my friends miss the times when they were too innocent (ignorant?) to be happy and not know any better. Thanks for commenting. I checked out your site. Good luck with your book. I can’t speak for your parents but I know I don’t want to hold my children back. I’m sure I’ll love and enjoy them at every age. Of course, our relationship will change as their needs will be different. I bet there are days when your parents wish they were children without responsibilities. That’s normal. My younger boy was also crazy for Thomas. When he went cold turkey with Thomas, it was a shock. Making new moments now, as you say, is so important even if they don’t seek them out. I do miss how our kids used to say certain words. Caleb used to say “squirlo,” “girlo,” and “worlo” for squirrel, girl, and world. Now he has that “rl” sound down and it’s sort of sad. At the time, did you think it was cute or did you worry? I bet it was at least little worrisome. Now, that it’s past, all you remember is the cute. Either way, I know what you mean. Being a child certainly had its benefits – that’s for sure! Babies belong behind glass, where they can stay little! We all have to grow up some time. First off – Happy Birthday, SJ!!! 8 is a great year!! Secondly – I find myself still wanting to wander through the toy section despite the fact that I have 2 teenagers. I still think a great movie night is the latest Disney flick even though they’d rather see the latest Marvel release. Many of my friends have children under the age of 10. It’s interesting when we have our yearly get-to-togethers because they often forget how much older my children are than theirs. They get a quick reminder when they see that Rian is 5’10” and Alexi’s not far behind. Since I have a boy and a girl there are things I experience with one that I don’t with the other (puberty was an interesting time with my son since I have no idea what it was like to be a 13-year-old boy). But I know I have cherished every first – first step, first word, first day of school, first date. I know it won’t be long and they’ll both be living independent lives. And as much I miss 1, 2, 10, 12 I am focusing on enjoying what’s left of 16 and 14. Good post, I feel like by age seven I’ll be a wreck. I think the thing I miss the most about my children’s first year is the naps we used to take together. Nowadays it’s few and far between that we gather up on the couch and take a nap together. Thanks for sharing this, I really enjoyed it! You’ll be fine. You’ll grow as your child does. P.S. My eight-year old and I still take naps together sometimes.